Bus parking is available at the Trolley Museum and along East Strand. Your group may also bring a picnic lunch. Tables are located at TR Gallo Memorial Park, Kingston Point and the Trolley Museum. If you plan to have a picnic, mention this when you make your reservation. 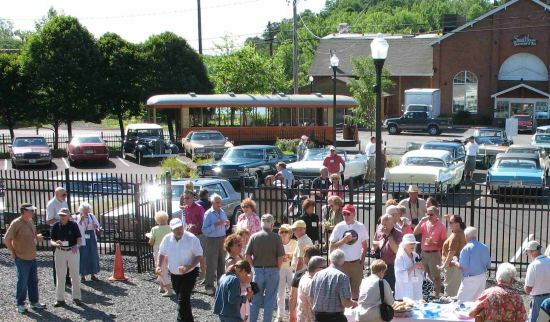 Groups with a particular interest in trolley cars, railroading or transportation history are certainly welcome to spend more time in the Visitors Center and Restoration Shop. Plan your time accordingly. The trolley seats 28 people, so if your group is larger than 28 it will be split so some ride the trolley while the others visit the museum and then swap (per additional fee listed above). There are restrooms in the Trolley Museum Visitors Center and at TR Gallo Memorial Park. The Trolley Museum Visitors Center also has a gift shop. Write, or call the museum, 845-331-3399, to make your reservation. Ask for Jerry Herman. We hope your group enjoys its time at the Trolley Museum of New York. Cancellation Policy: Cancellations accepted up to 48 hours in advance, but the deposit remains nonrefundable. Consider the museum as a host for your special event or meeting. The unique setting of the museum can enhance your event. Call the museum office at 845-331-3399 and see how we can make your event a reality.